Schweitzer has an amazing crew of dedicated professionals who are here to help you learn (and continue learning) all about skiing and snowboarding! Here's a peak at some of our incredible team. To reserve a spot with one of them or any of our instructors please contact us with your request at lessons@schweitzer.com or 800-831-8810 ext 2374. If "fun" and "learning" go together in your mind, then you will enjoy her coaching. Ursula has been a ski instructor for 20 years. She began teaching at Mammoth Mountain in California. The fall of 1991 was her first season at Schweitzer, and she is still here! She is very enthusiastic about continuing her learning so she can share it with you!! If it slides on snow, Spencer can teach it. All ages, all abilities, all disciplines. Not only is Spencer one of our most requested instructors for skiing he is also trained to handle adaptive skiing equipment. When Spencer isn’t teaching (which is a rare moment) you can find him charging down his favorite run, Stiles. Larry Keister is one of our most sought after instructors from the more “mature” clientele. Larry will quickly have you mastering the skills needed to enjoy skiing. In a previous life he was a big wig in the military and now he works closely with our Nice Turns program, but with some advanced notice is also available for private lessons. Although Susanne claims to be a snowboarder we have spotted her occasionally on skis. Her teaching focus is to promote good riding skills and ultimately out ride the boys. In advanced lessons she likes to tear up K-Macs or cruise Cathedral on the backside. Oh, and good luck finding her on a powder day! We highly recommend reservations if Suzanne sounds like the perfect match. Specialty: Susanne can do it all. Tina is a very patient instructor. She knows how to have fun and put her guests at ease. She challenges her guests just enough for success while staying safe in the process. She is always about the needs of her guests and seeing that a good time was had by all. A very friendly ,fun and easy going spirit she has. Bob enjoys skiing and is grateful for the opportunity to share that love. All skiing is fun, both alpine and Nordic. Nordic is a wonderful way to stay in shape and provides an excellent opportunity to get "out-of-doors" in the winter months. That said, alpine skiing at Schweitzer Mountain is pure enjoyment & fun. Fresh corduroy is a blast, but for a real "e-ticket" nothing beats skiing off piste in the trees or on a steep run. Come see Bob where he loves to be... as long as it is on the mountain in the winter! Debra has a deep love of all types of skiing. You can find her rockin' the bumps on Heather's Run or gliding quietly out on the cross country ski trails. She is a truly gifted women's instructor with a balance of enthusiasm and nurturing to help the client become the skier they've always wanted to be. From beginner kids to expert adults, Debra can improve the client's skiing ability while enabling them to enjoy the entire skiing experience. Prior to coming to Schweitzer, she taught at several resorts including Heavenly Valley, California and Mt. Ashland, Oregon. If you want to have fun and learn in a relaxed, friendly lesson, be sure to make a reservation with Debra. Shawna grew up in the Pacific Northwest as part of a skiing family. With a degree in Outdoor Education, her commitment to life-long learning helps others safely develop skills and build confidence while learning the sport of Alpine Skiing. Exploring the mountain environment with someone who is positive, patient, and encouraging makes learning fun and exciting. Shawna enjoys coaching students and sharing her love for skiing. She holds Alpine Level 2 certification, Children’s Specialist Level 1, and builds skills through ongoing clinics, training, and workshops to help people stay on the cutting edge of tips and techniques. People of all ages, abilities, and backgrounds appreciate how Shawna adapts to the best learning style, helping take this fun sport to the next level. . Skiing is something that everybody can enjoy; young, old, or somewhere in between. With proper coaching you can learn the joy of alpine skiing. I’d like to share my passion for skiing technically and laying down huge “Cadillac” turns anywhere on Schweitzer Mountain! I’ll put a smile on your face. Matt has been Snowboarding since the late 80's although not very well at first, and skiing since he was 5. He likes to take that first timer and really get them turning well and also likes to take anyone to the next level regardless of their current level. He is also constantly trying to improve his own snowboarding to be a better teacher. In the summer he runs a horse ranch and guides trail rides for guest at Schweitzer. Specialty: I love working with fearful students or anyone looking to move up to the next level. I love to see my student take on a new challenge. Terry has made his career in Snowsports with winters at Schweitzer and summers spent coaching race camps at Mt. Hood. His long tenure as an Examiner and PSIA NW Technical Team member gives him a depth of experience in how to make skiing and snowboarding easier for you. He loves showing kids how to be able to out-ski their folks, and still spends plenty of time in the Terrain Parks. He recently stepped down from Ski School management because he wanted to get back on the snow and teach full-time again. Specialty: Anyone who is motivated to learn. If you are starting a second discipline he has a broad background to help transfer your skills. Jim has coached skiing, football, and many other sports in both the US and internationally. He has a Ph.D. in kinesiology and is able to bring that discipline into practical movement on the mountain. He loves working with kids, and is actually still a kid at heart, but he has the ability to work with all ages of people. A former professional football player, he can take the lessons learned through competiting at the higest levels and use them to develop confidence and skill. Natalie grew up skiing the "frozen granular" slopes of Vermont; after discovering western powder in the 1980s, she's never looked back! A Schweitzer "regular" since 2001, Natalie decided to share her love of skiing by becoming an instructor. 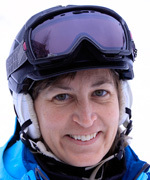 Whether you are a beginner or a seasoned skier looking to improve your skills, Natalie can help. She will demystify the technical aspects of skiing movements so that you can experience an "aha" moment. Cyndy's fun, energetic, and genuinely kind personality combine with a lifelong love and knowledge of skiing to make time spent on the hill with her valuable, rewarding, and addicting. Specialty: Encouraging students through skill development to conquer more of the mountain. ​To reserve a spot with any of our instructors please contact us with your request at lessons@schweitzer.com or 800-831-8810 ext 2374.